It's no secret that I love Terlingua, the new-ish barbecue restaurant on Washington Ave. in Portland. The owners are friends of mine, for one, but their restaurant is the whole package--a relaxed environment, friendly service, tasty food, and great cocktails and draft beer. Plus it's within walking distance of my house. So while I've been for drinks and dinner many times (I even hosted a tequila tasting there, one of the best Portland Spirits Society events to date), I hadn't been to brunch. And the buzz about brunch was building, so A. and I made a post-spin class date to check it out. The dish I'd been hearing the most about was the pulled pork benedict ($13), so clearly that was on the agenda. The other menu choices that sounded tempting were the chilaquiles, or strips of corn tortillas served with beans and eggs ($10) and the burger with its bacon-jalapeno jam ($14). 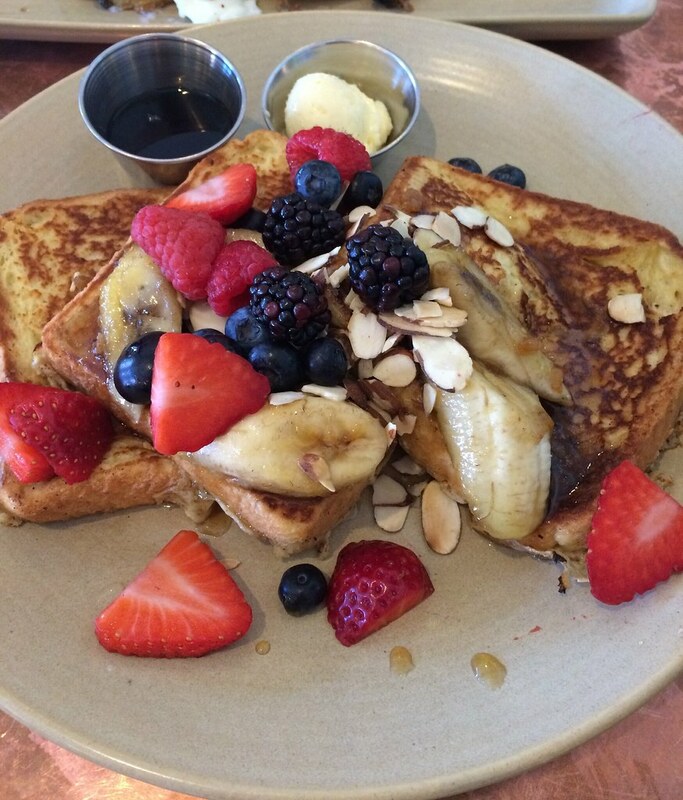 But I've been on a french toast kick lately (well, specifically the Palace Diner's version), so Terlingua's with caramelized bananas, berries, whipped honey butter, and almonds ($10) sounded really appealing. A. ordered a mimosa, and while there's an extensive list of breakfast cocktails, I went with the lime Topo Chico (Mexican sparkling water). A. and I shared both dishes and the server was very accommodating in getting us extra plates and quickly clearing away dishes when we were finished with them, as the small two-top table was filled by the large plates. The french toast transcended a lot of other versions that are just egg-coated bread. This was custardy on the inside and as you can see, it came covered in fruit, which helped to add interest and keep the dish light. After moving quickly through a few slices of toast each, we turned our attention to the long-awaited, much-heralded benedict. 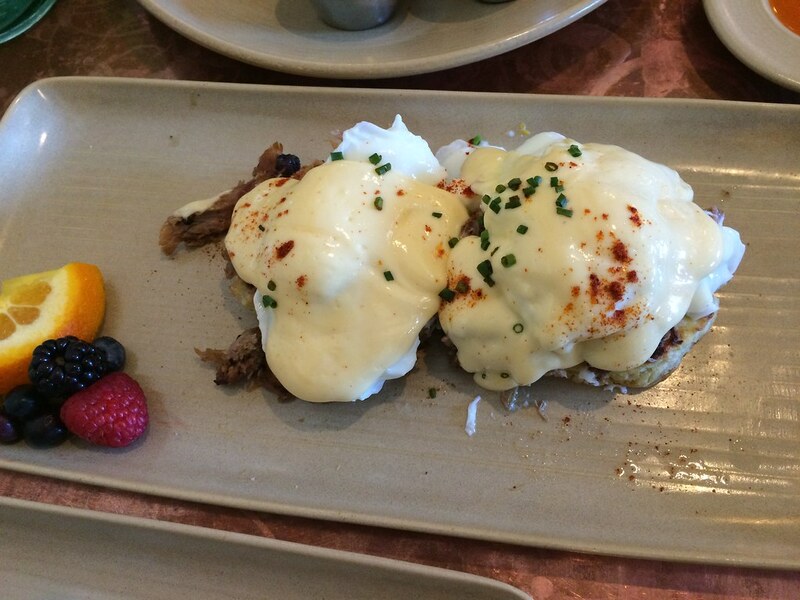 The poached eggs and pulled pork are served on a green chile biscuit and then topped with a jalapeno hollandaise sauce. The dish avoided all the common pitfalls: the biscuits were light, the hollandaise actually had some flavor, and the pulled pork wasn't too salty or heavy. It was as delicious as everyone has said. So add me to the list of people recommending Terlingua for brunch, but really for any meal. The brunch menu is available Sundays from 10am until 3pm, and they do not take reservations. Shortly, you'll even be able to enjoy eating outside at picnic tables on the patio!